90° offset style collar removal tools may be driven directly with a standard hand ratchet, or fitted to an extension for deeper access. If you face a particularly challenging application, our experienced staff will be pleased to work with you and make a tool recommendation. This 90 Degree Offset Style collar removal tool allows for removal of Eddie-Bolt nuts located in restricted areas. Square Drive: 3/8''. This 90 Degree Offset Style collar removal tool with open end allows for removal of Eddie-Bolt nuts located in restricted areas. Square Drive: 3/8''. 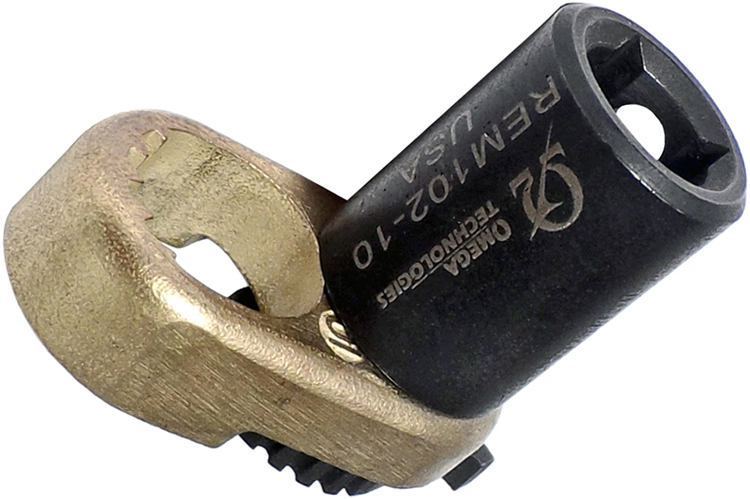 This 90 Degree Offset Style collar removal tool allows for removal of Eddie-Bolt nuts located in restricted areas. Square Drive: 1/4''. This 90 Degree Offset Style collar removal tool with open end allows for removal of Eddie-Bolt nuts located in restricted areas. Square Drive: 1/4''.